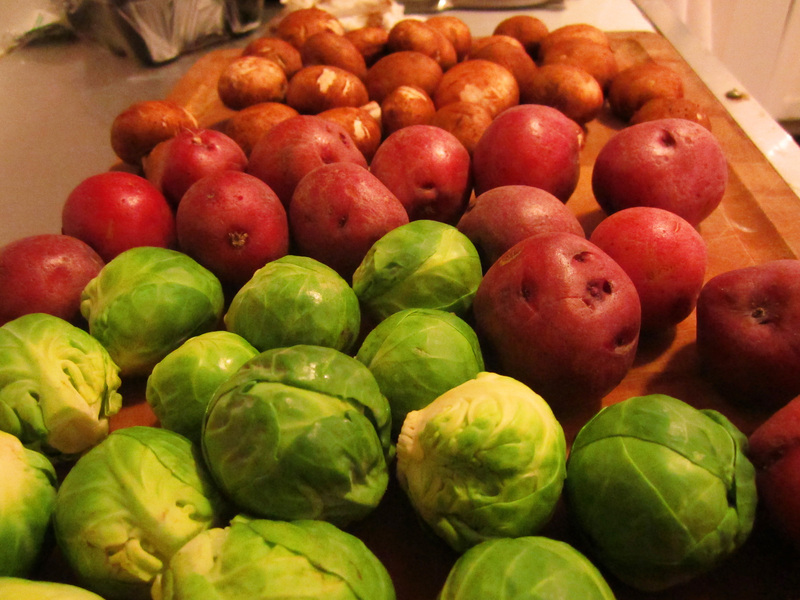 This is one of my favorite go-to meals to make when it’s a brisk autumn day in LA. And with the amazing team at McCall’s Meat & Fish just up the street, I find myself making this dish almost once a week. Mussels don’t need to be scary. Especially if the shop you buy them from cleans them for you already. 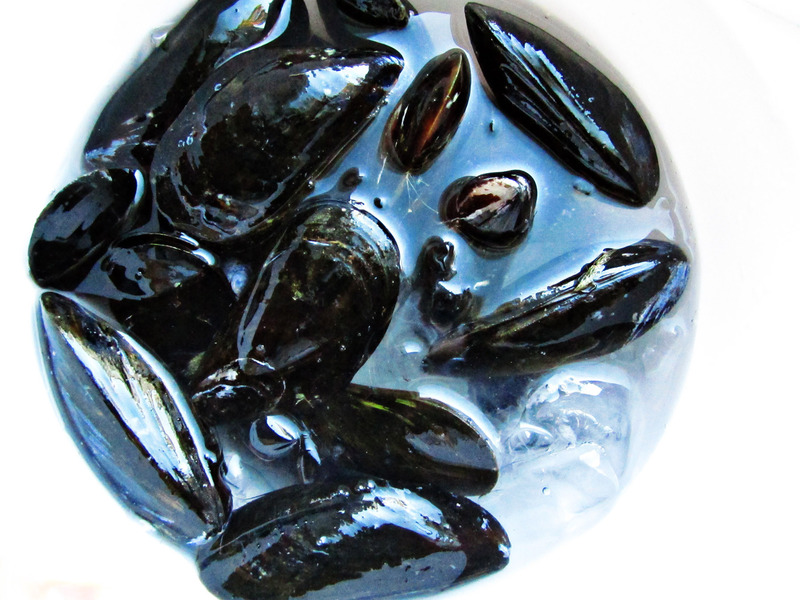 To store mussels prior to cooking, rinse in cool water and store in a bowl half filled with ice. 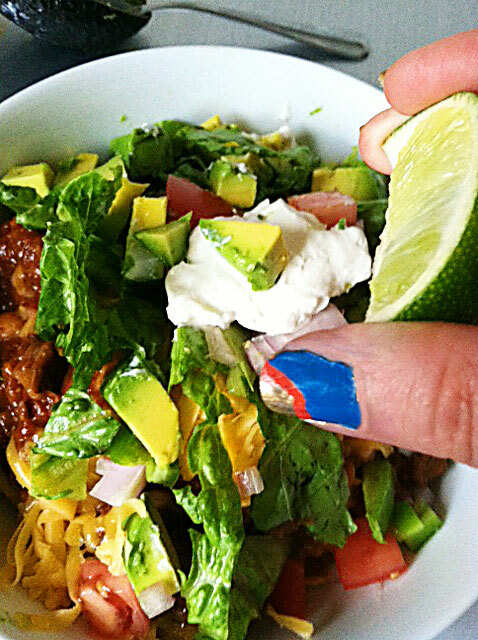 Place a damp towel over the top of the bowl. You need to keep the mussels cool, moist, and with good oxygen access. So don’t wrap them up in plastic wrap or otherwise suffocate them. 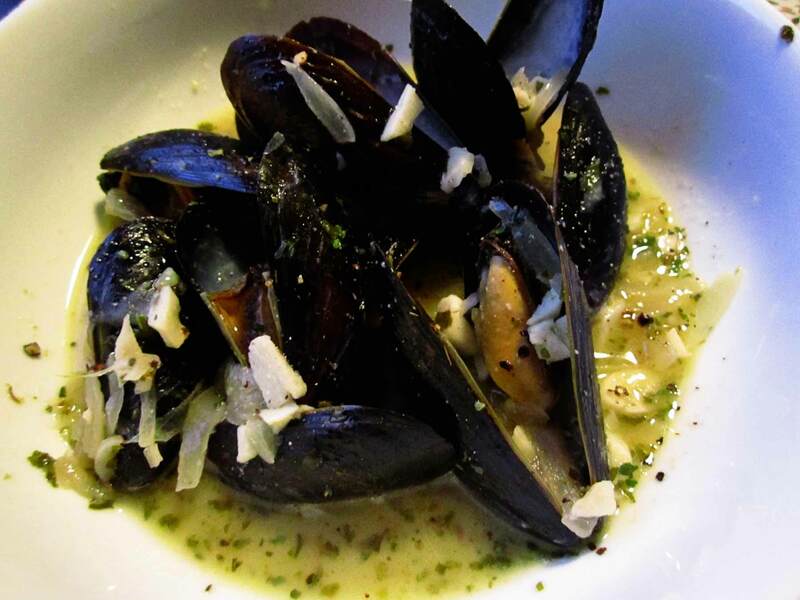 Eat mussels during cool months, and those containing the letter ‘R’ in their name– September, October, November, etc. Pair these mussels with plenty of crusty bread and the Autumn Version of the Gent’s Salad. It is fair to note that I love a lot of garlic, and a lot of broth with my mussels. If I’m feeling particularly decadent, I’ll make a batch of french fries to go along with this. In the pursuit of sopping up all that delicious broth, french fries are definitely my weapon of choice. But chunks of crusty baguette are a close second. In a 4 qt dutch oven (or any large pot with a lid), heat one tablespoon butter with 1 tablespoon olive oil over medium high heat. Add onion and cook until translucent. Toss in garlic and cook until fragrant. De-glaze the pan with white wine, then add chicken stock and herbs. When the stock comes to a boil, add mussels and give one big stir. Cover pot and reduce heat to medium. steam Mussels for about 8 minutes, or until they open. Discard any unopened mussels. Finish with final 3 tablespoons of butter. Serve with plenty of broth in a flat bottom bowls. The Gent very eagerly brought home a bunch of kale a few weeks ago and absolutely hated it. Too bitter for him. It’s one of those greens that is great on paper, but sometimes too overpowering on the palate. So I baked the Kale with some olive oil, salt & pepper for about 20 minutes in a 400 degree oven to create Kale chips. 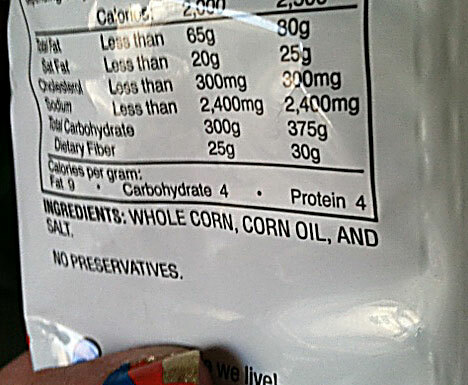 They are fantastic on a salad, adding an earthy base note for the brighter elements to play off of. A creamy buttermilk dressing, the bright bite of tomato, and crunch of a buttery crouton…. you know what you could also add to this? Bacon. umm…. I’ll be right back…. 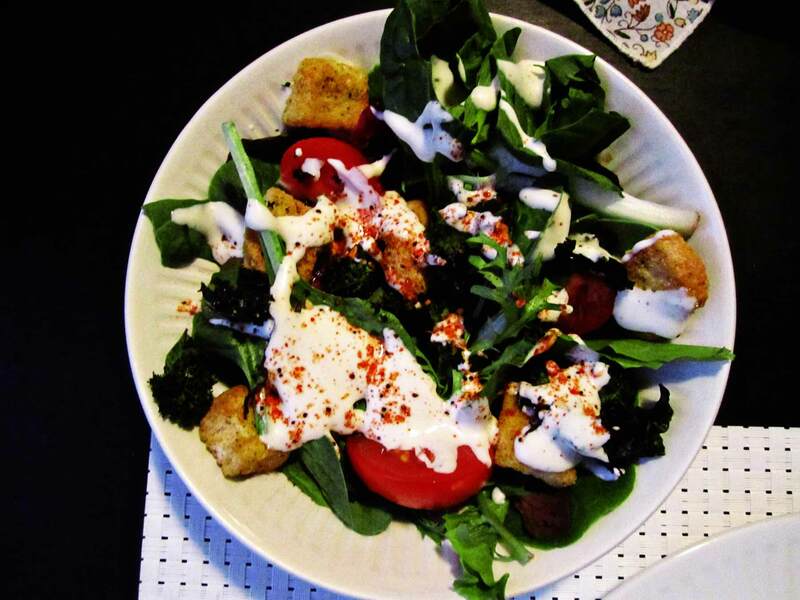 Layer ingredients in a flat bowl, finishing with dressing & a sprinkle of Salad Seasoning. It was a rainy day in Los Angeles yesterday, perfect weather for a long cooking project. 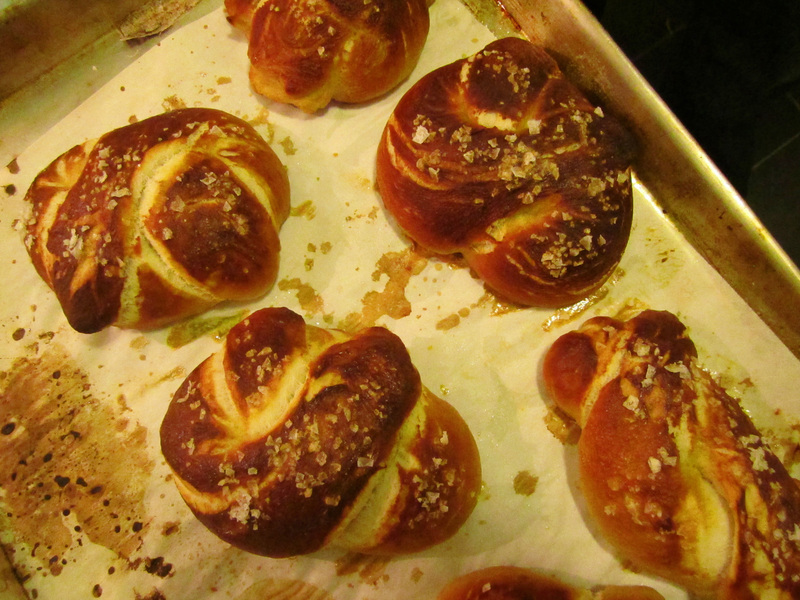 Parker House Rolls have been on my list for awhile, and considering their 3 hour prep time, it was a perfect fit. 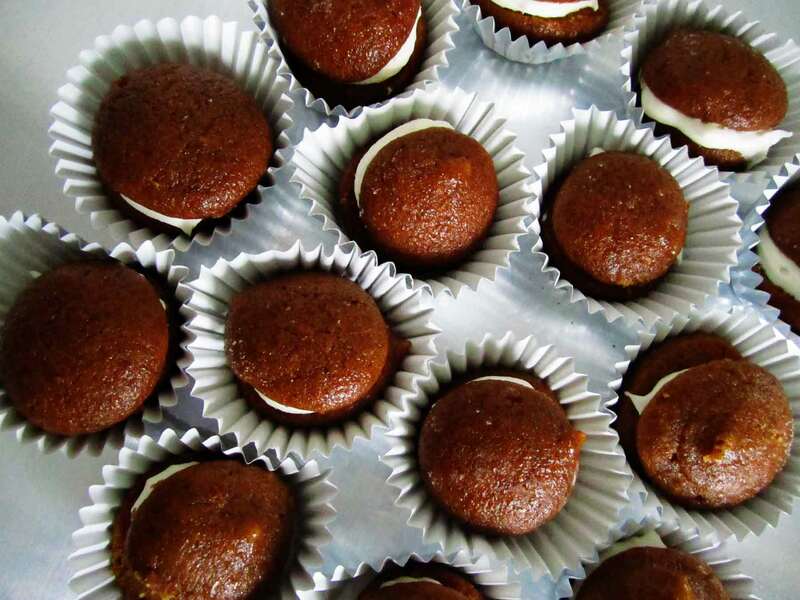 I aggregated a couple recipes, but the one I hewed closest to came from Chowhound. These were great with a roast chicken dinner, and equally delicious for breakfast this morning with a little grapefruit curd. 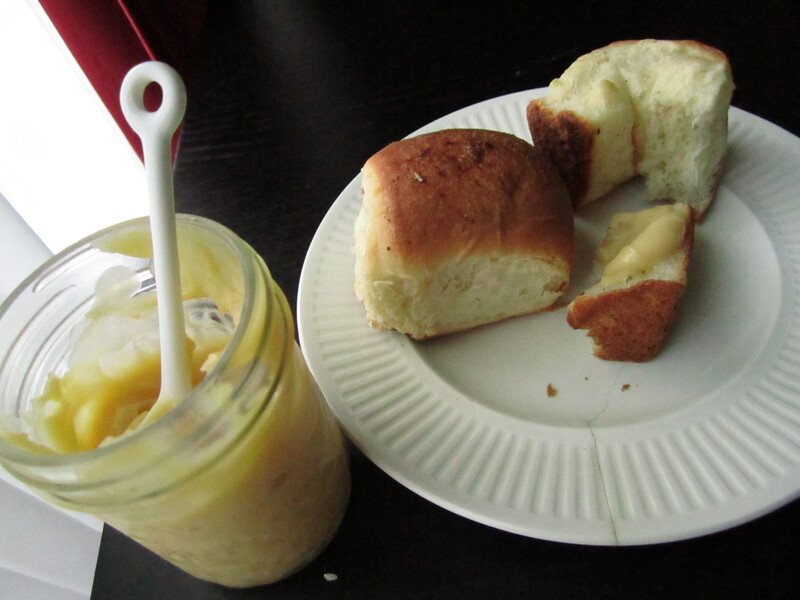 The combination of the lightly sweet roll, savory butter, and creamy tartness of the grapefruit curd is so elegant and delicious with a cup of coffee or tea. Combine spices, salt, honey and olive oil in a microwave safe bowl. Zap the mixture in the microwave on medium power for 30 seconds. Mix in butter. cover tightly and chill in the refrigerator until ready to use. Dissolve yeast in warm water in a medium bowl; set aside until foamy, about 5 minutes. Stir lemon juice into milk and let sit for a couple minutes. Add honey, & milk mixture into yeast mixture; set aside. 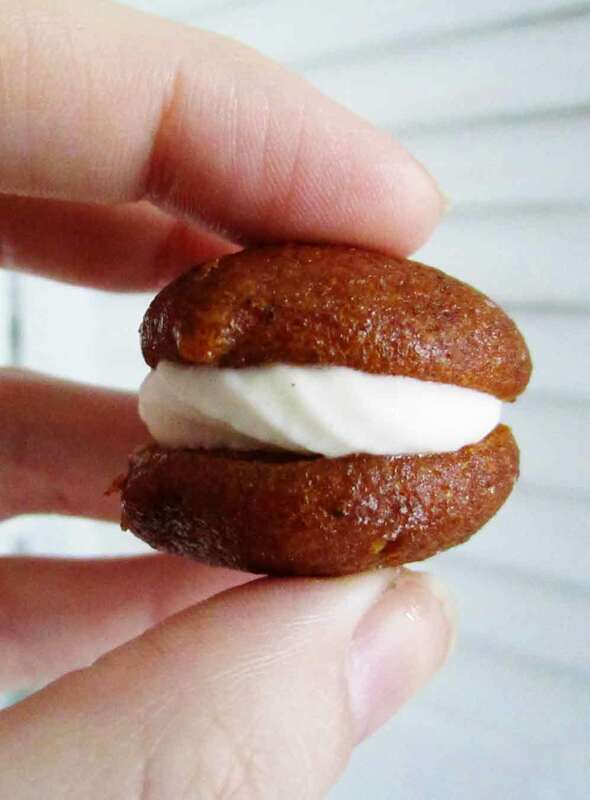 and salt in the bowl of a stand mixer fitted with a dough hook, make a well in the center, pour in yeast mixture, and mix on low speed until evenly incorporated, about 2 minutes. Increase mixer speed to medium low and add butter, a few pieces at a time, letting butter completely incorporate before adding more. Mix dough until smooth, elastic, and slightly soft, about 10 minutes total. Butter a large bowl, place dough in the bowl, and turn to coat. Cover with a damp kitchen towel and let rise in a warm place until doubled in size, about 1 hour. Meanwhile, coat a 13-by-9-inch baking dish with butter. Once dough has risen, divide in two equal pieces. On a lightly floured surface, roll out one piece into a 12-by-10-inch rectangle, keeping the second piece covered with a towel. Cut the rolled rectangle of dough lengthwise into 5 strips. Cut each strip into 3 smaller rectangles. 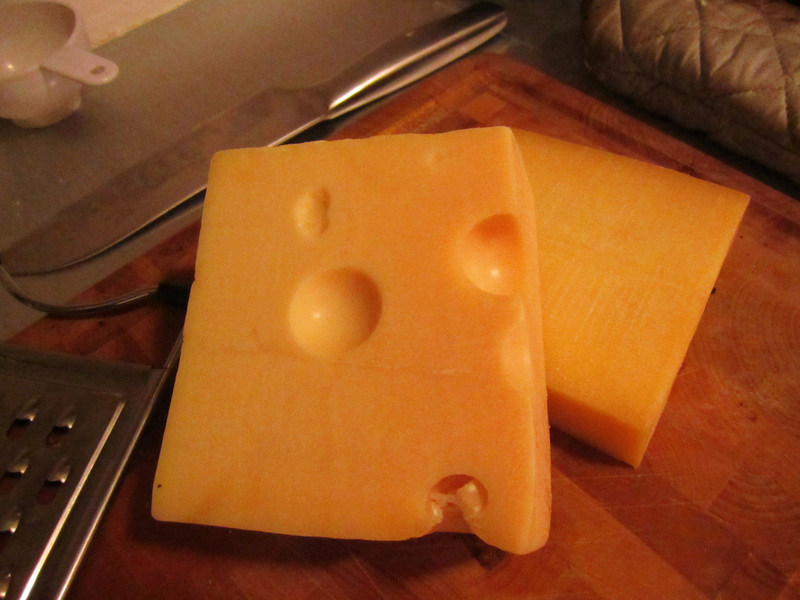 If using herb butter, spread 1/4 tsp of butter into each rectangle before folding the rectangle in half, and set aside. Repeat with remaining rectangles. Repeat entire process with second piece of dough. 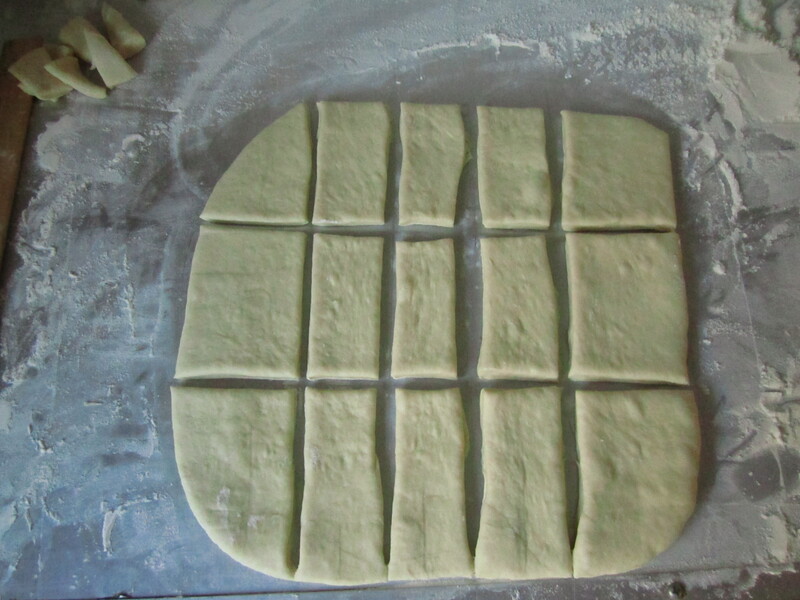 Arrange rolls seam-side down in the prepared pan, 6 across and 5 down. Cover with a clean kitchen towel and let rise in a warm place until doubled in size, about 1 hour. Meanwhile, heat the oven to 350°F and arrange a rack in the lower third. 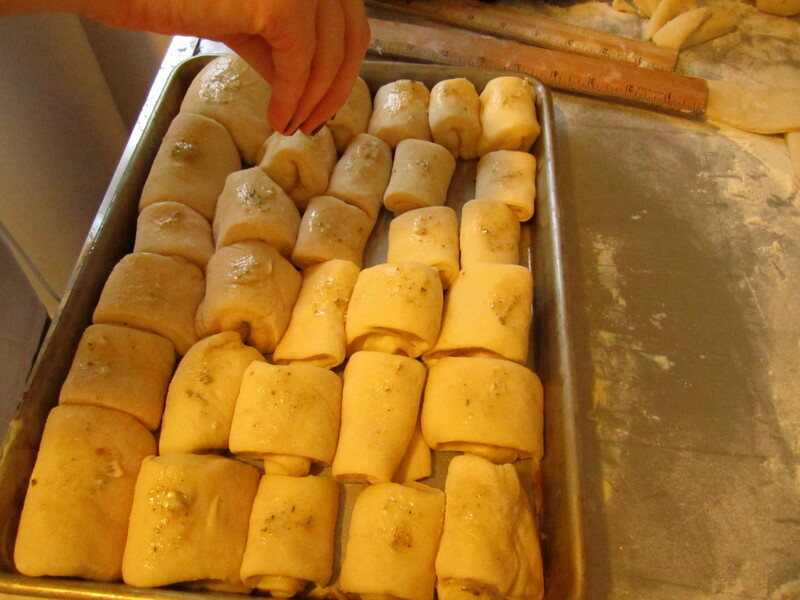 Once dough has risen, brush herb butter (or regular butter) over top of rolls and sprinkle with coarse salt. Bake until bottom and tops of rolls are golden brown, about 40 minutes. Remove from the oven, let cool 5 minutes, and serve. 1. Put butter and vanilla in a bowl. Place mesh strainer over bowl and set aside. 2. Combine juice, sugar, yolks, and cornstarch in a heavy-bottom saucepan over medium low heat. Whisk constantly until smooth. 3. Continue to whisk slowly as mixture thickens. Keep the mixture moving to prevent the eggs from cooking too quickly and clumping. 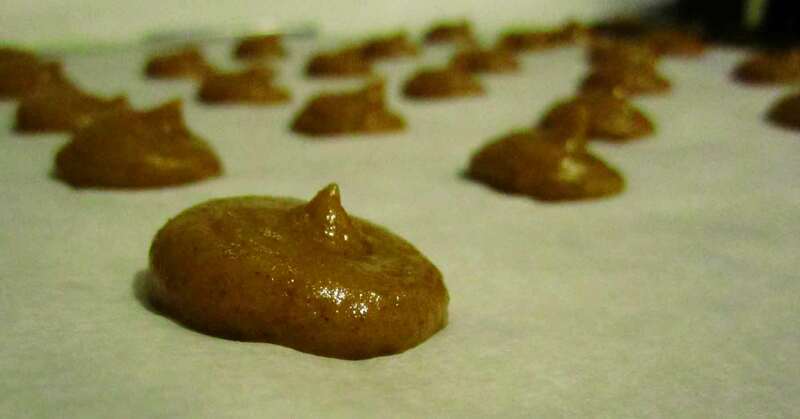 After about 5-7 minutes, the mixture will become very thick, almost the consistency of creamy peanut butter. 4. Remove from heat, pass through the mesh strainer into the bowl with the butter and vanilla. Remove strainer and discard solids. whisk the curd in the bowl until vanilla and butter are incorporated. 5. pour into jars and cool, or cover the bowl with plastic wrap (pressing plastic wrap directly to the surface to prevent a skin from forming), and cool. For my birthday dinner a week ago, The Gent whisked me away to a lovely little oasis in the desert of Vegas, a lovely, clever, well-appointed bistro called Marche Bacchus. It’s a waterfront bistro behind a wine shop, in the suburb of Summerlin. There is no strip, no slot machines, if it weren’t for the heat, you would never know you are in Vegas. In the United States, 9% of the total workforce finds employment in restaurants. In Vegas, the percentage must be three times that. It is this fact that creates the perfect recipe for Marche Bacchus. The wine shop in the front of the dining room is your wine list. You can stroll among the aisles, roll the bottles in your hands, debate with your dining partner about the pros and cons of this bottle or that one. Then decide to just compromise and get both. The Gent and I started with the Melka ‘CJ’ Cabernet. 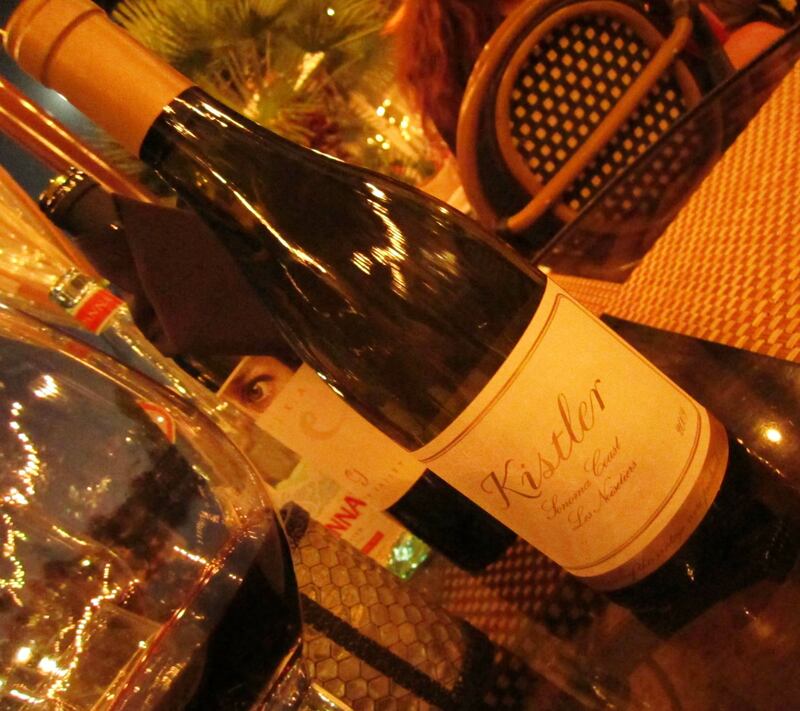 Then nabbed a bottle of Kistler Chardonnay after we ordered practically every seafood item on the menu, and thought we should have a white wine, too. Two bottles of wine enjoyed between two people is a recipe for a lovely birthday dinner, but a terrible one for getting photographs in focus, so this post is slightly lacking in the latter. Our server, Paul, was perfect. As much as I love LA, and I love my staff, there is nothing like being in the hands of a server who truly enjoys food, wine, and service. He was conversational when we had questions, knew the menu like a song, and was gracious when we came in close to the end of the night and bought two bottles. He knew he’d be there to close the place down with us. The food was all thoughtfully prepared. 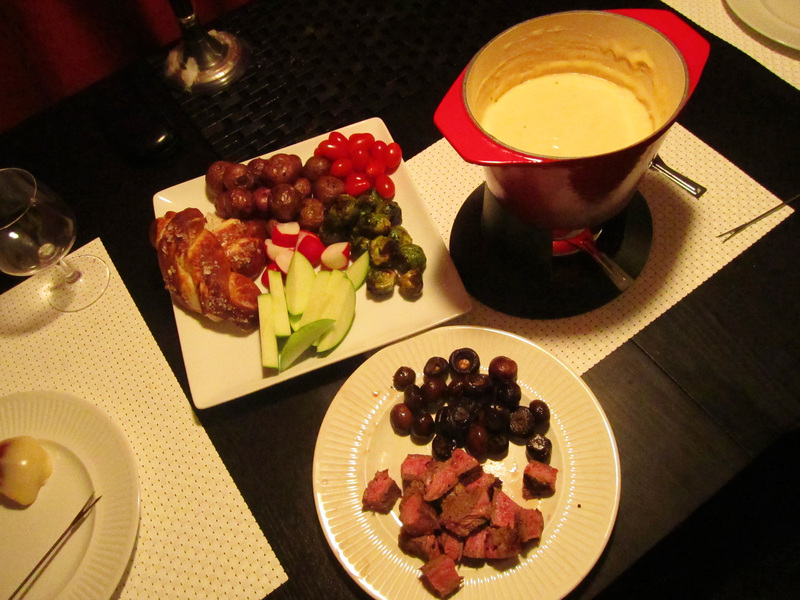 We started with the cheese plate, which we usually do if there is one on the menu. 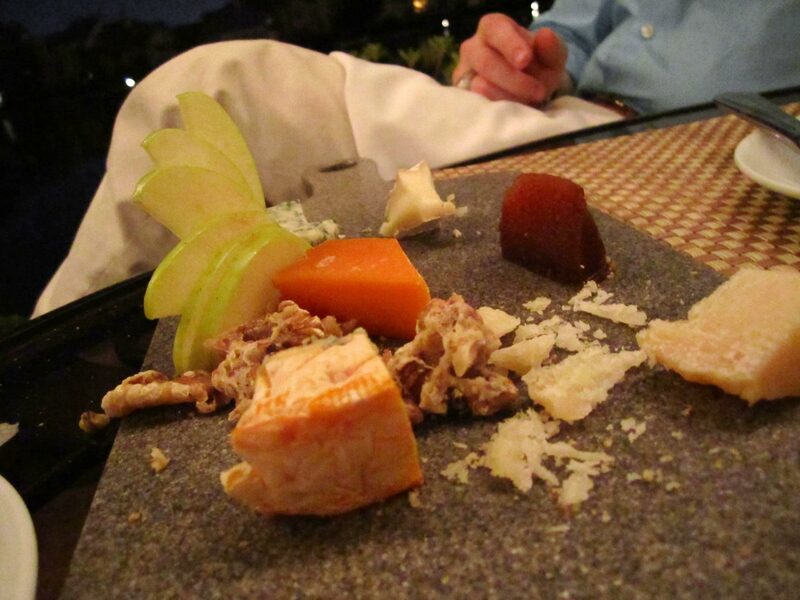 Rather than just the usual brie, chevre, and humboldt fog, this one featured mimolette, something like an asiago, something goopy, something bleu…. it got fuzzy with all the wine and good company. But they were all tasty. If there is escargot on the menu, the Gent always bites, and I ordered the beet salad with smoked trout & apple to start. 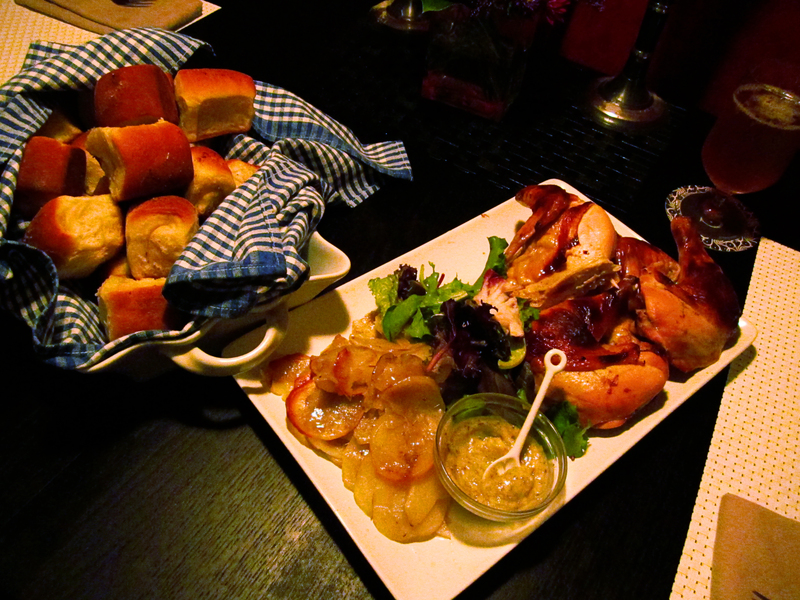 Entrees were Prince Edward Island mussels, and pan-roasted Idaho trout with a crab and roasted pepper salad. We couldn’t have possibly fit dessert in our stomachs, but Paul grabbed us a decadent flourless chocolate cake for my birthday. I generally hate ‘closing the place down,’ but this time it was unavoidable. You can’t order two bottles of wine with dinner and not stay awhile. We definitely left an appropriate tip.If you are in Vegas, and you love wine, you should definitely head to Marche Bacchus. But don’t ruin it for the rest of us. Be cool.